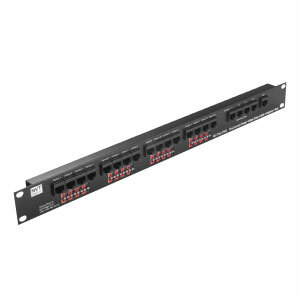 Typically installed in the wiring closet or IDF room, the NV-716J-PVD is a “pass-through” wiring device that efficiently consolidates camera power, video, and pan/tilt/zoom telemetry data onto a minimum of 4-pair RJ45 cables. Power, video and data are converted at the camera using a PVD™ transceiver which utilizes a single 4-pair cable with RJ45 connectors to deliver each camera‘s signals to the NV-716J-PVD. Up to sixteen cameras are supported. The NV-716J-PVD receives low-voltage camera power from any third-party multi-output Class 2 power supply. Control Room connections are achieved with a single 4-pair RJ45 cable for each group of four cameras. P/T/Z telemetry data, if required, passes through another 4-pair RJ45 cable. Control Room connections may be made using any multi-channel NVT receiver or hub. All equipment employs industry-standard EIA/TIA 568B pinouts.